The Cyclone Global Navigation Satellite System (CYGNSS), launched on 15 December 2016, is a NASA Earth System Science Pathfinder Mission that is intended to collect the first frequent space‐based measurements of surface wind speeds in the inner core of tropical cyclones. Made up of a constellation of eight micro-satellites, the observatories provide nearly gap-free Earth coverage using an orbital inclination of approximately 35° from the equator, with a mean (i.e., average) revisit time of seven hours and a median revisit time of three hours. This inclination allows CYGNSS to measure ocean surface winds between approximately 38° N and 38° S latitude. This range includes the critical latitude band for tropical cyclone formation and movement. CYGNSS has the capability to measure the ocean surface wind field with unprecedented temporal resolution and spatial coverage, under all precipitating conditions, and over the full dynamic range of wind speeds experienced in a tropical cyclone. This mission intends to accomplish this through an innovative combination of all-weather performance Global Positioning System (GPS) ocean surface reflectometry with the sampling properties of a dense constellation of eight observatories. What makes CYGNSS unique is that it is NASA’s first mission to perform surface remote sensing using an existing Global Navigation Satellite System (GNSS)— a satellite constellation that is used to pinpoint the geographic location of a user’s receiver anywhere in the world. A number of GNSS systems are currently in operation, including: the United States’ Global Positioning System (GPS), the European Galileo, the Russian Federation’s Global Orbiting Navigation Satellite System (GLONASS), and the Chinese Beidou. CYGNSS has opted to use only the United States’ GPS constellation. Unlike radar scatterometers (e.g., ISS-RapidScat, QuikSCAT, and ASCAT) that both emit microwave radar pulses and receive their backscattered signals, CYGNSS functions as a constellation of passive sensors that receive the signal of surface-reflected GPS pulses. One of the most well-known limitations of traditional microwave scatterometry (particularly, Ku-band) is signal degradation of the microwave pulses when passing through intense rainfall as typically observed within hurricane eyewalls, thus limiting its utility in retrieving observations of high wind speeds in this critical region of the storm. Reflected GPS signals, on the other hand, operate at a much lower microwave frequency utilized by the GPS constellation that is able to penetrate thick clouds and precipitation around the eyewall and provide the first opportunity to remotely measure inner-core wind speeds. The goal of the mission is to study the relationship between ocean surface properties (i.e., surface wind speed), moist atmospheric thermodynamics, heat transfer, and convective dynamics in the inner core of a tropical cyclone. This will allow scientists to determine how a tropical cyclone forms, whether or not it will strengthen, and if so by how much. The successful completion of these goals will allow the mission to contribute to the advancement of tropical cyclone forecasting and tracking methods. 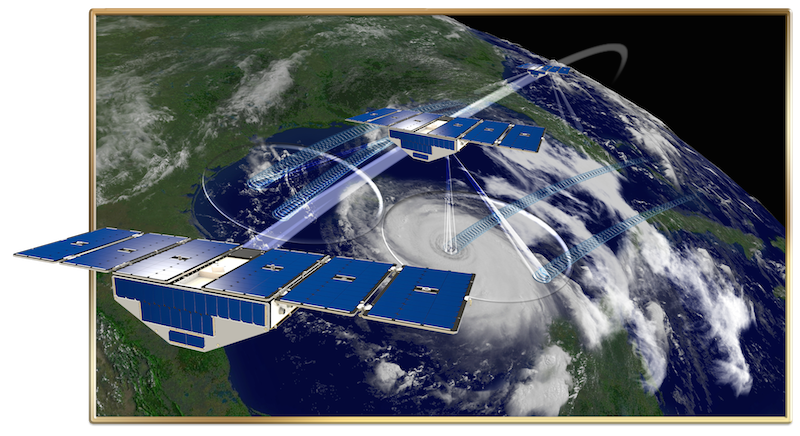 The PO.DAAC is pleased to announce the public release of the Cyclone Global Navigation Satellite System (CYGNSS) Version 2.1 Science Data Record. CYGNSS is a NASA Earth System Science Pathfinder Mission collecting the first frequent space‐based measurements of ocean surface wind speeds in the inner core of tropical cyclones. Made up of a constellation of eight microsatellites, the observatories provide nearly gap-free Earth coverage using an orbital inclination of approximately 35° from the equator, with a mean (i.e., average) revisit time of seven hours and a median revisit time of three hours. This inclination allows CYGNSS to measure ocean surface winds between approximately 38° N and 38° S latitude. This coverage is targeted to observe ocean surface wind speed within the critical latitude band for global tropical cyclone formation and movement. Version 2.1 represents the second “post-provisional” release of the CYGNSS Science Data Record generated using calibrated and validated level 1 algorithms. All data users moving forward are advised to use this latest version for fundamental science and applied research activities. The Level 1 (L1) Science Data Record contains measurement of surface Normalized Bistatic Radar Cross Section. The Level 2 (L2) Science Data Record contains derived ocean surface wind speed and mean square slope (MSS). The Level 3 (L3) Science Data Record delivers hourly averaged wind speed and MSS provided on a 0.2x0.2 degree latitude by longitude equirectangular grid. Each L1, L2, and L3 data file is provided in netCDF-4 format using internal compression. All data files provide data covering up to a full 24-hour UTC day. The L1 data files are specific to one of the eight CYGNSS observatories. The L2 and L3 data files consist of an aggregation of data provided from all operating observatories for a given day. The time series for all datasets starts on 18 March 2017 and continues to the near present day with a maximum mission-specified latency of 6 days. Actual data latency may oscillate between 1 to 6 days from the last retrieved observation with lowest possible latency for the L1 data. Starting at Version 2.1, all previous data gaps due to high beta angle spacecraft maneuvering have been filled with a properly corrected calibration. DDMI – Delay Doppler Mapping Instrument is an L-band receiver is designed to directly receive direct signals from GPS satellites as well as signals reflected off the ocean surface. The direct signals are used to pinpoint the location of the CYGNSS observatory (of which there are 8 unique spacecraft observatories), while the reflected signals correspond to ocean surface roughness, from which wind speed is estimated using a Geophysical Model Function (GMF). Clarizia, M. P., C. P. Gommenginger, S. T. Gleason, M. A. Srokosz, C. Galdi, and M. Di Bisceglie, “Analysis of GNSS-R Delay-Doppler Maps from the UK-DMC Satellite over the Ocean,” Geophysical Research Letters, Vol. 36, L02608, doi:10.1029/2008GL036292, 2009. Clarizia, M. P., "Investigating the Effect of Ocean Waves on GNSS-R Microwave Remote Sensing Measurements," Ph.D. diss., Univ. Southampton, 258 pp, 2012. Clarizia, M. P., C. Gommenginger, M. Di Bisceglie, C. Galdi and M. A. Srokosz, “Simulation of L-Band Bistatic Returns from the Ocean Surface: A Facet Approach With Application to Ocean GNSS Reflectometry,” IEEE Transactions on Geoscience and Remote Sensing, Vol. 50, No. 3, March 2012. Clarizia, M. P., Ruf, C.; Jales, P. and Gommenginger, C., “Spaceborne GNSS-R Minimum Variance Wind Speed Estimator,” IEEE Trans Geosci. Remote Sens., 52(11), 6829-6843, doi: 10.1109/TGRS.2014.2303831, Nov. 2014. Clarizia, M. P., and C. S. Ruf, “Wind Speed Retrieval Algorithm for the Cyclone Global Navigation Satellite System (CYGNSS) Mission,” IEEE Trans Geosci. Remote Sens., doi:10.1109/TGRS.2016.2541343, 2016. End-to-End Simulator Technical Memo, A. O'Brien, CYGNSS Project Do148-0123_CYGNSS_E2ES_EM. Garrison, J. L., A. Komjathy, V. U. Zavorotny and S. J. Katzberg, “Wind Speed Measurement Using Forward Scattered GPS Signals,” IEEE Transactions on Geoscience and Remote Sensing, Vol. 40, No. 1, January 2002. Gleason, S., “Remote Sensing of Ocean, Ice and Land Surfaces Using Bistatically Scattered GNSS Signals from Low Earth Orbit,” Ph.D. diss., University of Surrey, UK, 213 pp, 2006. Gleason, S., S. Hodgart, Y. Sun, C. Gommenginger, S. Mackin, M. Adjrad, and M. Unwin, “Detection and Processing of Bistatically Reflected GPS Signals from Low Earth Orbit for the Purpose of Ocean Remote Sensing,” IEEE Transactions on Geoscience and Remote Sensing, Vol. 43, No. 6, June 2005. Gleason, S., C. Ruf, M. P. Clarizia, A. O’Brien, “Calibration and Unwrapping of the Normalized Scattering Cross Section for the Cyclone Global Navigation Satellite System (CYGNSS),” IEEE Trans. Geosci. Remote Sens., doi:10.1109/TGRS.2015.2502245, 2016. Katzberg, S. J., J. Dunion, and G. G. Ganoe, "The use of reflected GPS signals to retrieve ocean surface wind speeds in tropical cyclones," Radio Sci., 48, 371­387, doi:10.1002/rds.20042, 2013. Katzberg, S. J., O. Torres, and G. Ganoe, “Calibration of Reflected GPS for Tropical Storm Wind Speed Retrievals,” Geophysical Research Letters , Vol. 33, L18602, doi:10.1029/2006GL026825, September 2006. Komjathy, A., M. Armatys, D. Masters, P. Axelrad, V. Zavorotny, S. Katzberg, “Retrieval of Ocean Surface Wind Speed and Wind Direction Using Reflected GPS Signals,” Journal of Atmospheric and Oceanic Technology, 21(3), 515-526, 2004. Level 1A DDM Calibration Algorithm Theoretical Basis Document, S. Gleason, CYGNSS Project Document 148-0136-X1, Rev 1, 19 Dec. 2014. Level 1B DDM Calibration Algorithm Theoretical Basis Document, S. Gleason, CYGNSS Project Document 148-0137-X1, Rev 1, 19 Dec. 2014. Level 2 Wind Speed Retrieval Algorithm Theoretical Basis Document, M. P. Clarizia, CYGNSS Project Document 148-0138, Rev 2 Chg 2, 19 Nov 2015. Murray, J., C. Ruf, N. Baker, T. Lang, E. Uhlhorn, D. Masters, G. Halliwell, K. Carey, D. Helms, V. Escobar, W. McCarty, D.S. Green, T. Stough and A. Molthan, “Report on the NASA CYGNSS Mission Applications Workshop,” May 2015. Ruf, C., A. Lyons, M. Unwin, J. Dickinson, R. Rose, D. Rose and M. Vincent, “CYGNSS: Enabling the Future of Hurricane Prediction,” IEEE Geosci. Remote Sens. Mag., Vol. 1, No. 2, 52-67, doi: 10.1109/MGRS.2013.2260911, 2013. Ruf, C., A. Lyons and A. Ward, “NASA Intensifies Hurricane Studies with CYGNSS,” The Earth Observer, NASA, Vol. 25, Issue 3, 12-21, May-June 2013. Ruf, C. S., R. Atlas, P. S. Chang, M. P. Clarizia, J. L. Garrison, S. Gleason, S. J. Katzberg, Z. Jelenak, J. T. Johnson, S. J. Majumdar, A. O’Brien, D. J. Posselt, A. J. Ridley, R. J. Rose, V. U. Zavorotny, “New Ocean Winds Satellite Mission to Probe Hurricanes and Tropical Convection”, Bull. Amer. Meteor. Soc., doi:10.1175/BAMS-D-14-00218.1, pp385-395, Mar 2016. Ruf, C., P. Chang, M.P. Clarizia, S. Gleason, Z. Jelenak, J. Murray, M. Morris, S. Musko, D. Posselt, D. Provost, D. Starkenburg, V. Zavorotny, CYGNSS Handbook, Ann Arbor, MI, Michigan Pub., ISBN 978-1-60785-380-0, 154 pp, 1 Apr 2016. Ruf, C., R. Balasubramaniam (2018). Development of the CYGNSS Geophysical Model Function for Wind Speed. IEEE J. Sel. Topics Appl. Earth Obs. Remote Sens. doi: 10.1109/JSTARS.2018.2833075. Ruf, C., S. Gleason, D. S. McKague (2018). Assessment of CYGNSS Wind Speed Retrieval Uncertainty. IEEE J. Sel. Topics Appl. Earth Obs. Remote Sens. doi: 10.1109/JSTARS.2018.2825948. Ruf, C.S., C. Chew, T. Lang, M.G. Morris, K. Nave, A. Ridley, R. Balasubramaniam, “A New Paradigm in Earth Environmental Monitoring with the CYGNSS Small Satellite Constellation,” Scientific Reports, doi: 10.1038/s41598-018-27127-4, 2018.